This article is the second in a series sponsored by The Cochran Firm, lawyers for the parents of John Crawford III, who was shot and killed by police near Dayton, Ohio, in September. If you would like to support pipeline initiatives and continued research on diversity in the legal profession, click here to make a donation to Lawyers Of Color Foundation. Imagine for a moment that I’m Jake Brigance delivering my closing argument in the movie, A Time to Kill. I’d like to tell you a story. But first, you must forget what you know about the case of Freddie Gray, the 25-year-old black Baltimore man who died in police custody a week after he was seen on video being dragged by officers who arrested him for running from them after making eye contact. Close your eyes and imagine the prosecutor in this case. Her parents and grandfather are among five generations of police officers in her family. A working class kid who muscled her way into the upper middle class, she has little in common with Gray’s powerless and impoverished neighbors. But image that in spite of this, the woman chooses to embrace the righteous anger of the community protesters and accuses the police of making an illegal arrest and charges them with false imprisonment, manslaughter, and second-degree murder, which is punishable by up to 30 years in prison. Now imagine this prosecutor is white. Impossible, right? As the tally of inexcusable murders of unarmed black men (and boys) continues to climb, advocacy organizations, policy experts, and grant makers are working feverishly to devise solutions. In response to last year’s killing of Michael Brown, La June Montgomery Tabron, who heads one of the nation’s largest philanthropies, W.K. Kellogg Foundation issued a statement in which she astutely noted that deaths like Brown’s “demonstrate that the law-enforcement and justice systems in our nation are broken.” Yet protests, funding, and reform proposals have mainly focused on police. Notably the prosecutorial restraint white prosecutors have recently displayed toward police doesn’t extend to black defendants. A 2011 study of the New York County District Attorney’s Office (DANY) by Vera Institute of Justice found black defendants 19 percent more likely than whites to be offered plea deals that included jail or prison time. Blacks charged with misdemeanor person offenses or drug offenses were more likely than whites to be held in jail or prison at their arraignment and to be offered plea deals that included jail time. Such biases are largely responsible for the current makeup of the prison population. 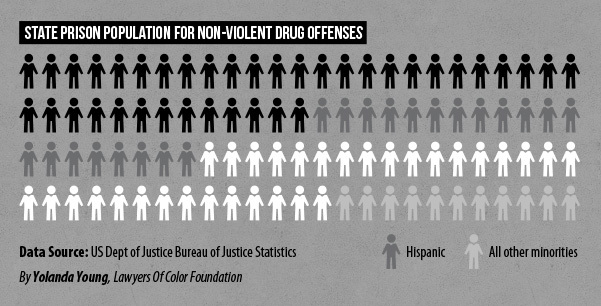 In 2012, African Americans and Hispanics accounted for 58% of those in prison for drug offenses. 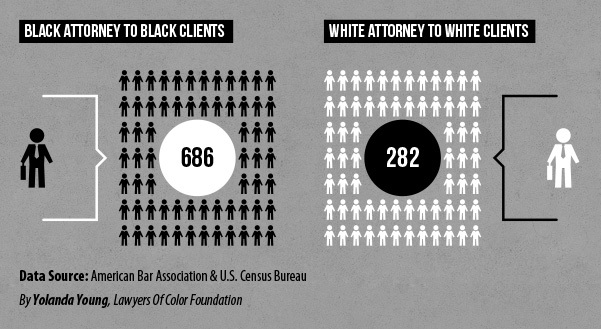 DANY’s prosecutors are 75% white and 10% black, with only 6% of black attorneys in supervisory positions. 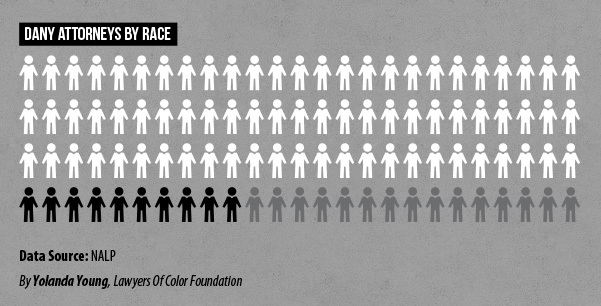 As troubling as DANY’s attorney demographics are in a system where a disproportionate number of defendants are black, DANY’s staff is actually more diverse than many DA offices across the country. This lack of diversity has had discriminatory consequences. The 2010 national study “Illegal Racial Discrimination in Jury Selection: A Continuing Legacy” by the Equal Justice Initiative uncovered “shocking evidence of racial discrimination in jury selection in every [southern] state.” The study found evidence that some state and local prosecutors were actually trained to exclude people on the basis of race and instructed on how to conceal their racial bias. 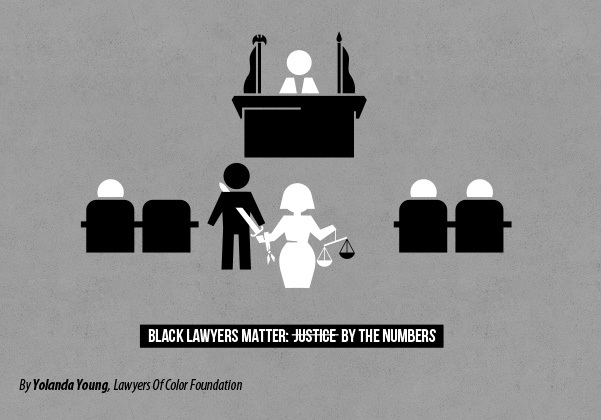 How we get those black attorneys in the room is a difficult question that demands an answer. Just ask the residents of Ferguson, Missouri. The public was shocked to learn that despite its black majority, only 6 percent of the police force is black. 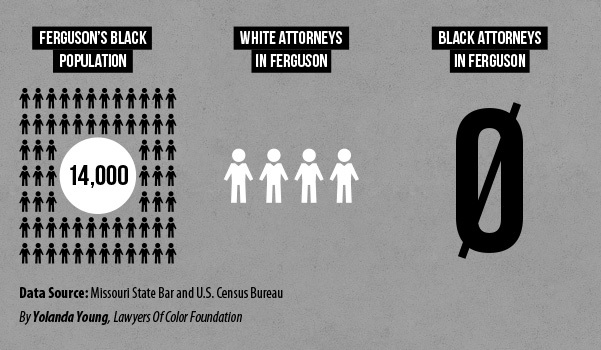 At the time of Brown’s killing, the number of black attorneys in Ferguson was zero, according to the Missouri bar, which listed only four white attorneys for the city’s 14,000 black residents, who were issued 92% of the city’s warrants and received 95% of two-day or more jail sentences. 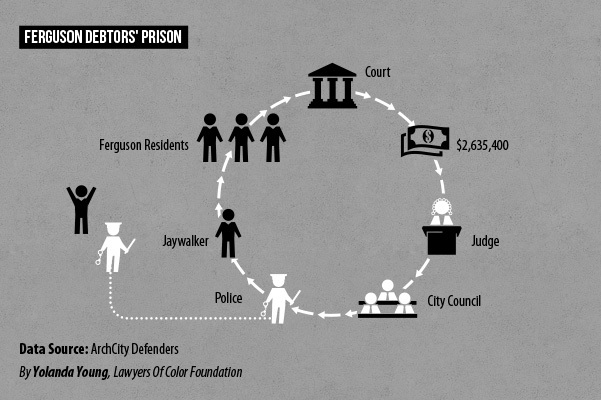 This according to the Justice Department’s scathing report on the Ferguson police department. And though neighboring St. Louis has a significant number of black attorneys, poverty, scarce public transportation, and lack of knowledge make that gulf much wider than the eight miles separating the two cities. 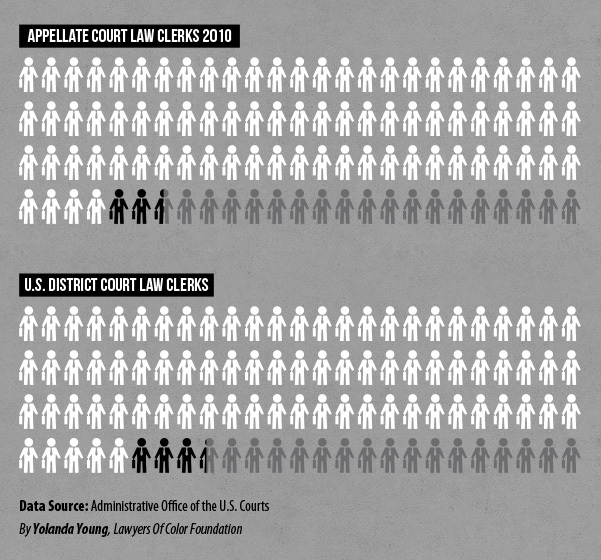 The lack of judicial diversity extends beyond federal courts to state benches where the majority of legal disputes are adjudicated. 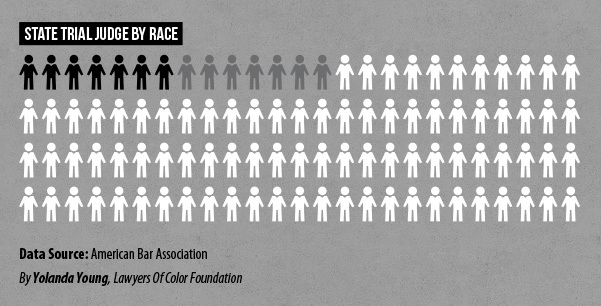 A report by the Brennan Center found that the judicial selection commissions of some states have no African American representation, and as recently as 2010 there were still some states with all-white benches. 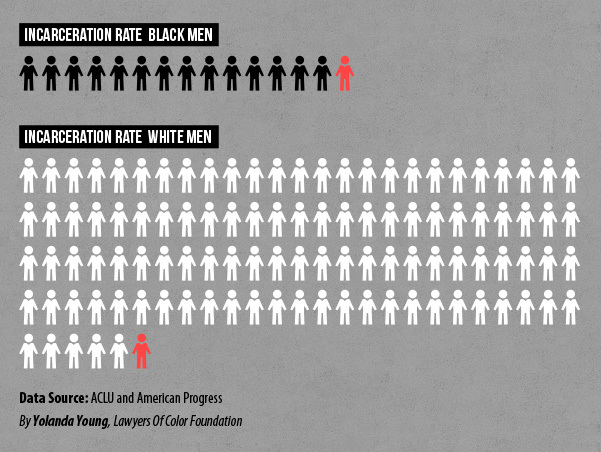 They also noted evidence that the number of black male judges is actually decreasing. 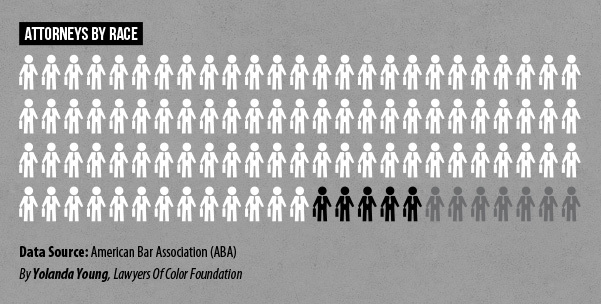 According to the American Bar Association, in state trial courts, where the vast majority of cases are handled, only 7% of judges are black. Foundations, corporations, advocates, and politicians should use their considerable power to bear down on the legal profession, which continues to fail at its critical mission to increase the number of black lawyers. For three decades, the legal profession has insisted that racial diversity was a priority, yet the profession remains stubbornly white. 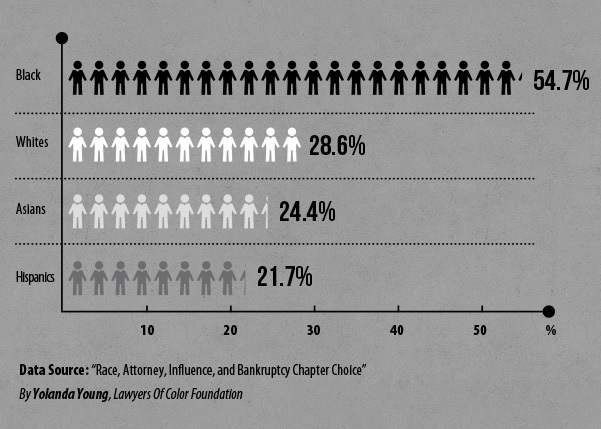 The last decade has seen the percentage of black attorneys stagnate, increasing by only .4%. 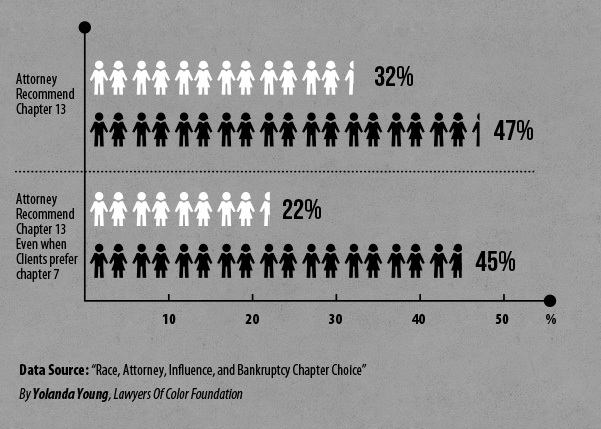 The percentage of African Americans at top law schools and large law firms has actually declined. This entry was posted in 5 Top Stories, Legal News, Uncategorized and tagged kellogg foundation, La June Montgomery Tabron, New York County District Attorney’s Office (DANY) by Yolanda Young. Bookmark the permalink.